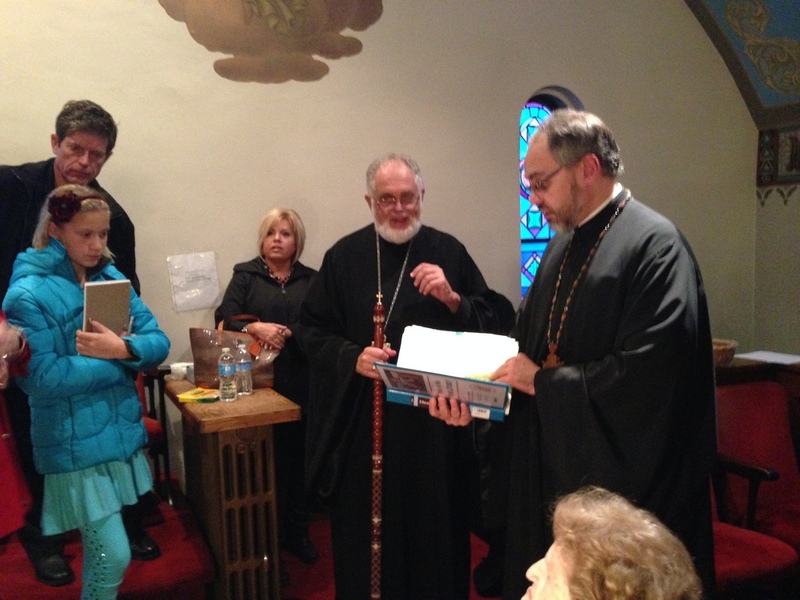 Archpastoral Visit to Youngstown, OH! 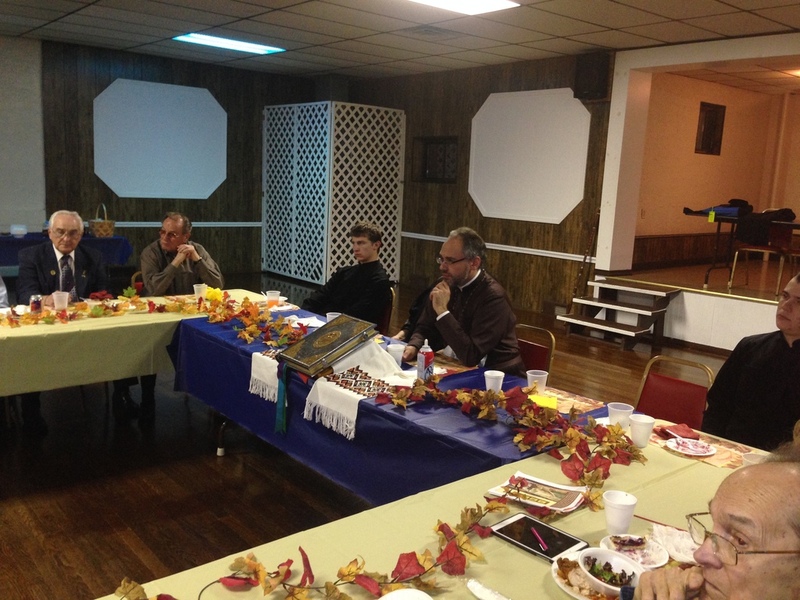 The weekend of November 2nd-3rd, 2013 saw His Grace, Bishop Daniel conduct an in-depth pastoral visitation at Sts. Peter and Paul parish in Youngstown, Ohio. Saturday morning saw the Liturgy with Deanery clergy for the All Souls Saturday commemoration to be followed by a meeting of the Penn-Ohio Deanery. Late afternoon saw Great Vespers, at which our choir gave the responses. 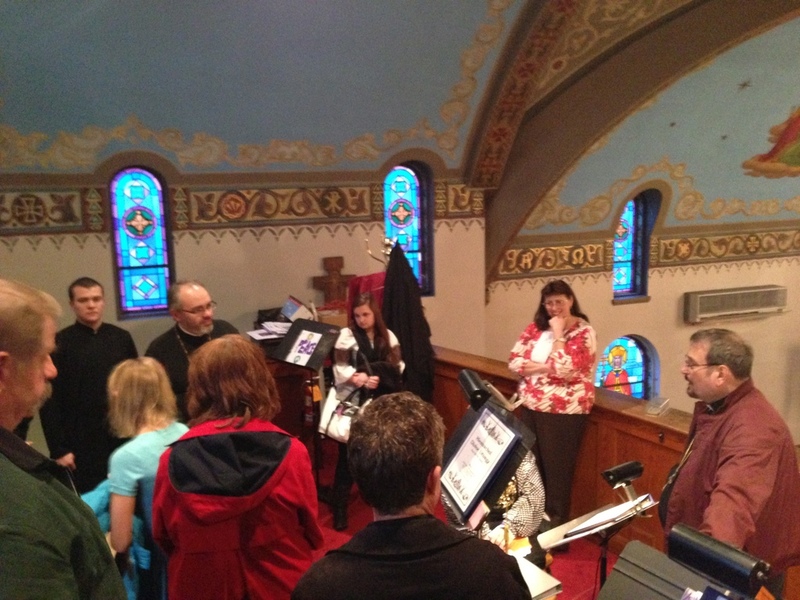 After Vespers, Bishop Daniel met with the choir and their director, Fr. Gregory Becker. 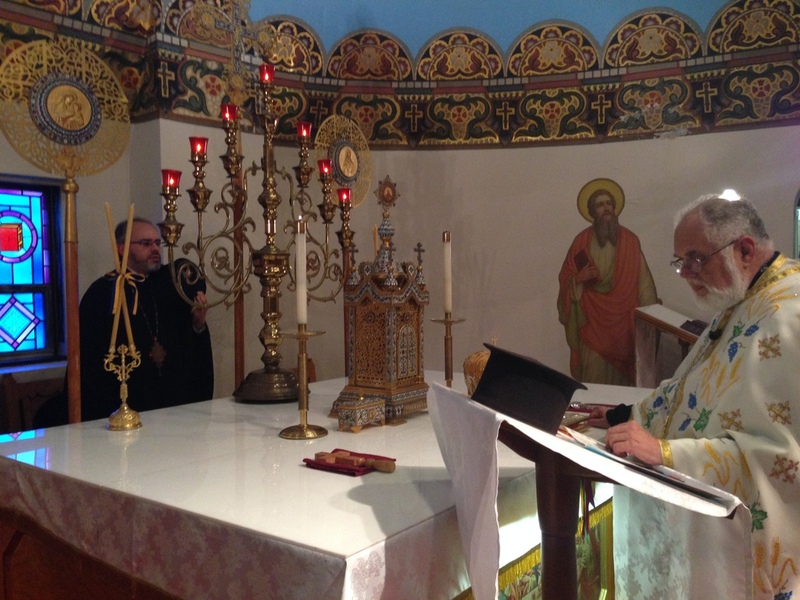 His Grace marveled at the wide repertoire of liturgical music and the various chants represented. Following this meeting a dinner was held at which the Parish Council, Trustees and head of parish organizations were present. 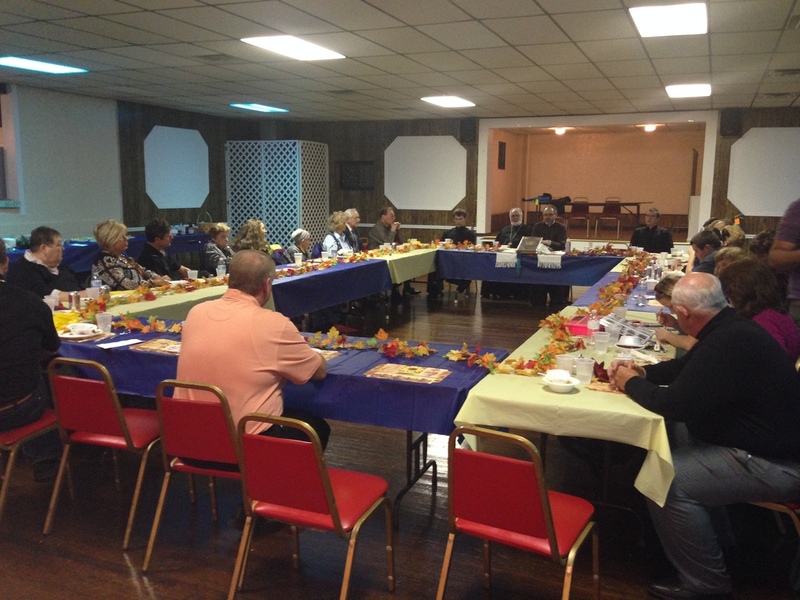 Tables were placed in a square so that Bishop Daniel and all those present could have easy face to face conversation. This forum provided an excellent time to become informed and to discuss issues both of the parish and the diocese, including those of the recent Sobor. As this parish is in the transition from a ”dues-paying” model of financial support to stewardship and eventual tithing, there were many questions raised especially concerning deficits. As our Metropolia will be going the way of stewardship at the next Sobor and has had massive deficits, other talking points were raised. Charles Woloschak, the head of the Brotherhood and the main spokesman for our stewardship programme sought direction at this current phase. 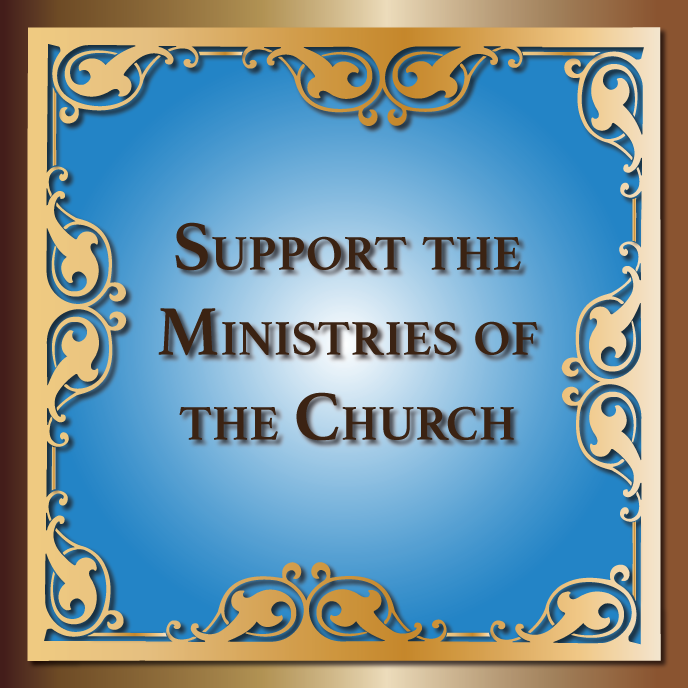 In the application of stewardship locally, all past debt (re. Dues) was duly forgiven and now membership revolves around yearly pledges. There is still much to be discussed and harmonized, but this relaxed, informal meeting set the tone that differences will eventually be resolved in a positive manner. Newly elected parish officers were charged with the spiritual mandate of their election by parishioners and they showed their acknowledgment of this sacred duty by kissing the Gospel book and accepting the blessing of Bishop Daniel. On a bright, sunny Sunday morning, children in costume and scattering rose petals greeted the Bishop on the stairs outside. The Parish Council President, Joseph Ewanish, warmly greeted His Grace to the parish and his wife Betty Ewanish presented a bouquet of red roses and baby' breath as a welcome from St. Mary's Sisterhood. The pastor Fr. John Harvey likewise welcomed him and presented the holy water and cross. 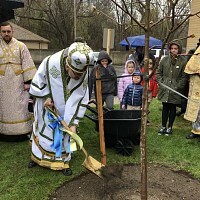 On this occasion, His Grace was accompanied by three seminarians, Ivan Chopko, and Volodymyr Suchanets, Sr and Jr,, who served with the parish's two subdeacons and two altar servers. 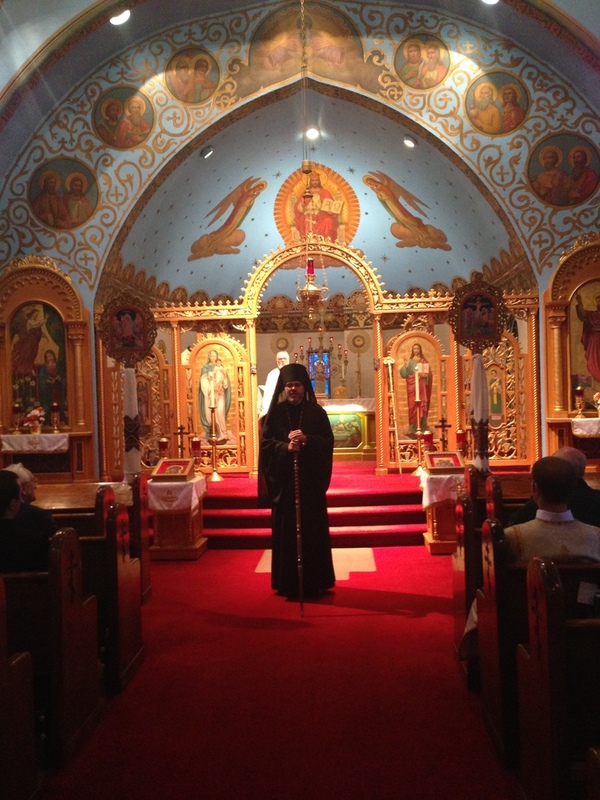 The hierarchal Liturgy was the highlight if his visit. His impassioned sermon given, as he strolled up and down the aisle, was riveting. His warmth and sensitivity was infectious and he directed all at the kiss of peace to greet those on all sides with sincere unfeigned love. The mood was spiritually intense and the choir was in the best form. Again a great variety was seen in the swiftly sung, yet prayerfully rendered selection of music. 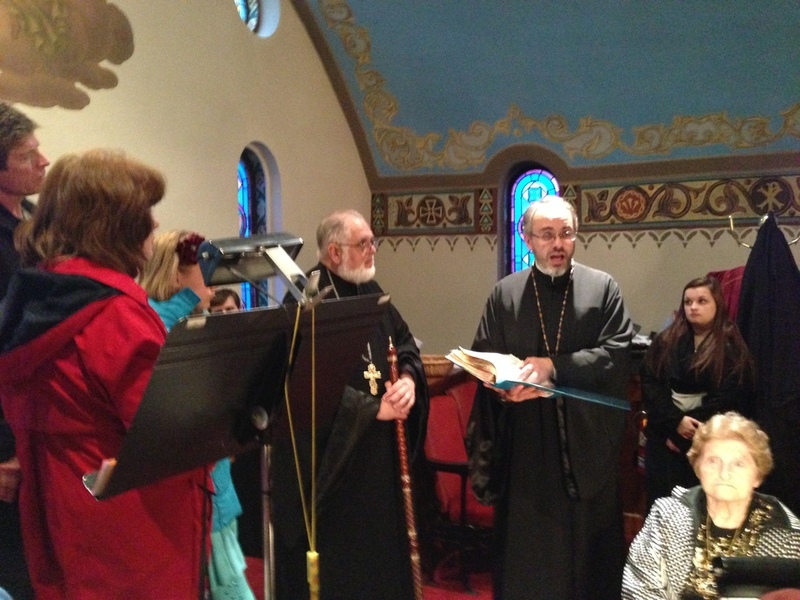 The creed was given in Serbian style of Byzantine chant and an exceptionally powerful litany by the Armenian composer Ekmalian got even His Grace to join in the singing, There were a great amount of communicants at this beautiful Liturgy. The day was made complete by the Second Annual Chili Cook-Off. Besides chicken, mamaliga and salads there were a total of thirteen luscious chili offerings in both traditional and non-traditional styles. All had a chance to vote for their favorites in three distinct categories. Due to the welcome presence of Bishop Daniel, he was given a special vote for the category of Bishop's Best. All participants were awarded a thank you certificate and the finalists each received a commemorative apron and gift. There was a full house for this fun event and His Grace entered into it with gusto. All enjoyed his presence and the relaxed banter, In the end, our Jr. UOL chapter presented the seminarians with a huge basket of snack foods and their favorite treat - Nutella. Bishop Daniel and his entourage bid farewell to happy parishioners who had enjoyed a very blessed weekend visitation. 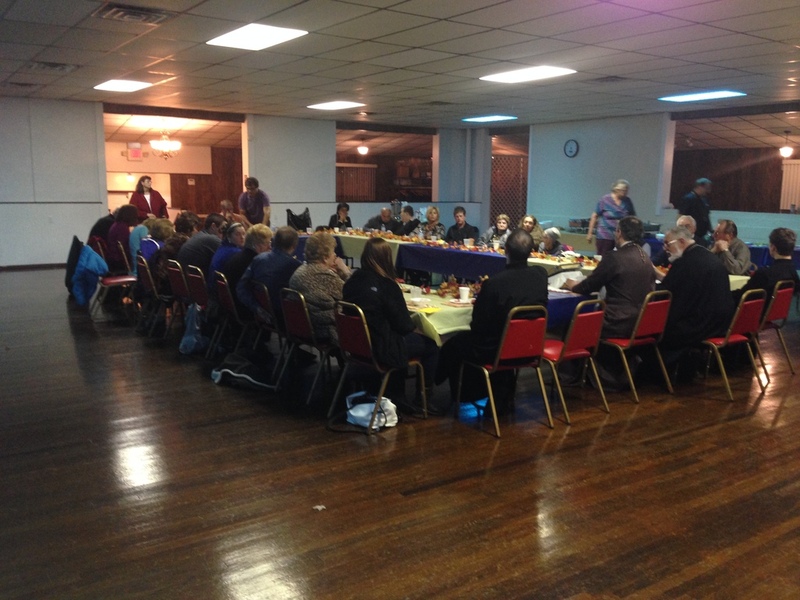 Penn-Ohio Deanery Meeting in Youngstown, OH!